This 2010 report provides background on the GM “Enviropig” which was halted in 2013 after farmer and consumer protests. 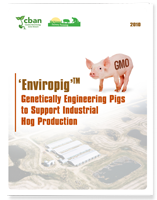 Enviropig was developed in Canada at the University of Guleph and was set to become the first GM food animal in the world. Who “Created” and Owns Enviropig™?